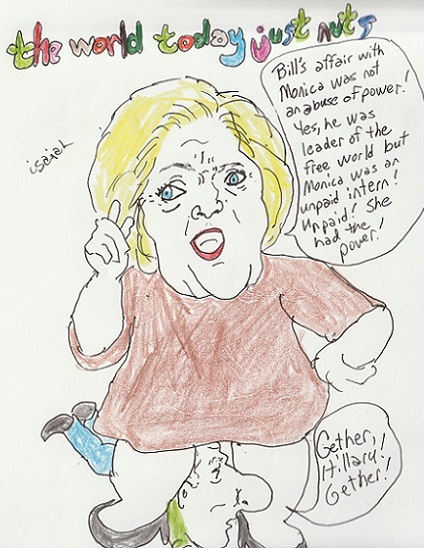 Isaiah's THE WORLD TODAY JUST NUTS "Get her, Hillary!" Ava and C.I.’s “TV: Roseanne didn't kill ROSEANNE, ABC did” notes how awful THE CONNERS TV show is. Channing Dungey is in deep trouble. I watched the first episode, so-so. I watched the second and couldn’t get through it. I didn’t bother with the third. (Ava and C.I. got all three episodes which is why they reviewed it.) It is awful. The show is the worst. Still, it’s a TV show and, having seen two episodes, I can report that it’s lacklustre, mostly unfunny and rather draining to watch. Roseanne Barr haunts The Conners like a laughing ghoul. You watch entirely in the context of, and thinking about, her and only her. There is certainly an attempt to shift away from the matriarch of the family after the opening episode and Sara Gilbert, as daughter Darlene, becomes rather like a Roseanne wraith, a phantom version of that rude, cackling and unapologetic working-class mother. But Darlene doesn’t spout pro-Trump derision of the world. Nobody spouts pro-Trump or anti-Trump statements about anything. The show is now a family sitcom, not a political hurly-burly. And it’s boring. So-so boring. John Goodman is the only good thing about the show. And he’s not enough. He’s good but he’s just not enough. How did this happen? And why is it allowed to continue? She needs to be fired immediately. Monday, October 15, 2018. Iraq struggles to form a government and, in the US, the Women's March on the Pentagon approaches. US State Department number two John Sullivan departs yesterday for Iraq to meet with the country’s new leaders, the highest level administration official to do so since their election. The US State Dept notes that Sullivan met with al-Mahdi on Sunday. On October 14, accompanied by U.S. Ambassador to Iraq Doug Silliman and Deputy Assistant Secretary of Near Eastern Affairs Andrew Peek, Deputy Secretary of State John J. Sullivan met with Adil Abd al-Mahdi, Prime Minister-designate. The Deputy Secretary congratulated Prime Minister-Designate Mahdi on his election, and together they committed to continue to build a strong and multi-dimensional relationship. 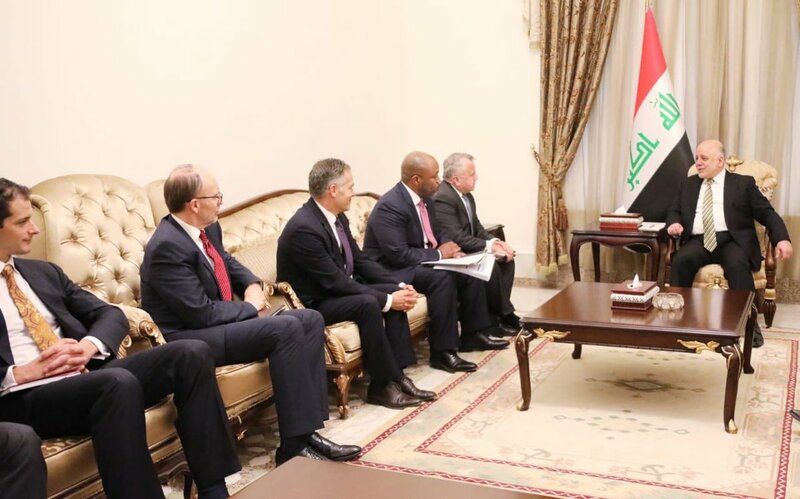 The Deputy Secretary encouraged Prime Minister-designate Mahdi to continue with government formation quickly and in a manner that is responsive to the needs of all Iraqis. The Deputy Secretary of State reaffirmed U.S. commitment to strengthen our ties with the people of this important country through our trade relationship, through cultural exchange, and through government-to-government relations. And, as the Tweet below notes, Sullivan's also met with the outgoing prime minister Hayder al-Abadi. "Gonna put it in the want ads." That's what Iraq's prime minister-designate Adil Abdul al-Mahdi did. Last week, Mustafa Abu Sneineh (MIDDLE EAST EYE) reported, "Iraq's new prime minister on Tuesday launched a government website allowing Iraqis to apply for ministerial jobs online, in an unprecedented move in the Arab states. Several Iraqis have already announced their applications on social media." RUDAW noted, "So far, 36,006 people have applied for a post in Iraq’s new cabinet, using the website set up by Prime Minister-designate Adil Abdul-Mahdi. The majority of applicants, 97 percent, are independents, according to figures released by Abdul-Mahdi on Facebook on Wednesday." ASHARQ AL-AWSAT finds a source who sees a strategy in the move, "When asked whether Abdul Mahdi would benefit from those who applied for ministerial positions through the e-portal, he replied that the assigned PM killed two birds with one stone by putting pressure on political blocs to submit the names of candidates to avoid choosing from names on the e-portal." While the move has been hugely popular with those applying, not everyone is thrilled. 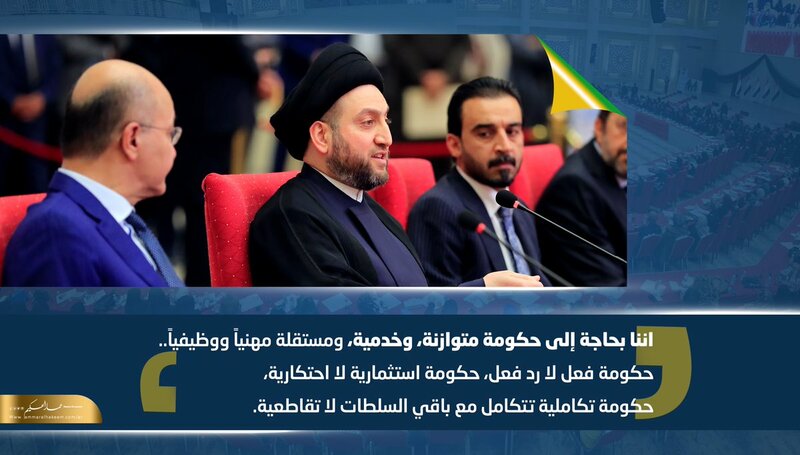 Today, IRAQ TRADE LINK NEWS AGENCY reports that Ammar al-Hakim (president of the National Wisdom Movement) feels this could destroy Iraq and that "we cannot look for ministers in universities, coffee shops and the streets." In the Tweet below, he's calling for an independent and professional government that's balanced and service ready. اننا بحاجة إلى حكومة متوازنة، وخدمية، ومستقلة مهنياً ووظيفياً.. حكومة فعل لا رد فعل، حكومة استثمارية لا احتكارية، حكومة تكاملية تتكامل مع باقي السلطات لا تقاطعية. In a statement directed at the Iraqi Sunnis and Sunni politicians, Sadrist movement leader Muqtada al-Sadr said that public interests should precede party interests, and that quotas should be avoided while forming the next government headed by newly elected Prime Minister Adel Abdul-Mahdi. Expelled from Jesuit missionary school in 1957 for joining political demonstrations, Mr Abdul Mahdi studied economics and trade in Baghdad and took a scholarship in Paris. With Saddam Hussein’s Ba’ath party in power, Mr Abdul Mahdi pursued academia and publishing in France, Lebanon and his mother’s home country of Syria, and travelled to Iran and the US. He later gravitated to Shia Islamist politics, and since 2003 has spent time as vice-president, finance minister and oil minister. Another leader, another flee-er. Iraq has so many who did not flee. When will one of them become the prime minister? Maybe on the day when the Iraqi people choose their prime minister instead of the selection being made by the governments of Iran and the US. Iraq is still not a democracy. Iraq is still not 'liberated.' Iraq is still both a crime scene and the location of an ongoing war. It's time to end the never-ending wars. One effort to do just that will take place this weekend in DC and many cities across the country, The Women's March on the Pentagon.